The AFX FX-41 Dual Sport Motorcycle Helmet is a helmet designed to meet the most rigorous standards for both on and off road riding. With excellent features dedicated to comfort and safety, the effort put into the FX-41 shows through. Features like the lightweight poly-alloy shell, the quick release tinted visor, and the ventilation system with 17 ventilation points throughout the helmet give you the most convenience possible. The list of features continues with a specially designed aerodynamic shape and removable, hypoallergenic liner. With even more features built in, it’s abundantly clear the FX-41 takes affordable, performance dual sport helmets to another level. And with all of this packed into a design that meets DOT certification, you’ll have enough peace of mind to take the FX-41 anywhere you want to go, on-road or off. It’s a nice fitting helmet but extremely loud at highways speeds, I removed the visor and that helps . I really like this helmet it fits perfect and feels a lot lighter than my old one, my neck muscles are relived. I bought this helmet for riding my SXS. I like the dual sport face shield better than goggles in the sand especially. when my other helmets would hit the head rest on the seat my goggles would shift and I would always get sand coming in at the bridge of my nose, Problem solved. 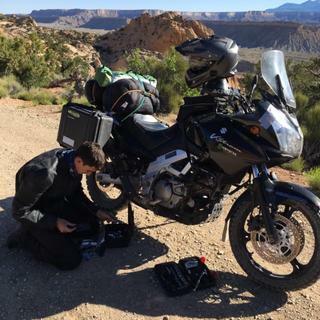 My last dual sport helmet was a MSR, It was stolen out of my toy hauler. I was going to get the same helmet but it was no longer available. The AFX has more features and it is more comfortable. I really like the tinted drop down lens for the sunny days in the dunes. Great helmet, especially for the price, I’ve had mine for two years now and still love it. I Would definitely recommend getting this helmet. Doesn’t fog too bad in cold weather and doesn’t over heat. The sunglasses are very helpful and quite nice. Only thing is over the miles the sunglasses only come down if you pull them down and not with the switch on the side. Great helmet I am so happy that I bought it. I have used this in the summer out in Moab trail riding and winter riding back and forth on the freeway to work. I don't use a windshield on my bike and the buffering at freeway speeds is not an issue. I picked this up mainly for dirt biking, only road riding is closing loops between trails. I was tired of fussing with goggles on my other dirt bike helmet and decided to go with a dual sport for the simplicity of the shield. This helmet is not noticeably heavier than my old dirt bike helmet (Answer brand don't know model). The convience of the flip up/down visor is AMAZING I wish I would have done this years ago. Fussing with goggles over spectacles was always a chore to get the helmet off/on quickly but the visor and ratcheting chin strap make on/off MUCH better. PLUS very little fogging up when breathing hard, and if fog does occur I just flip open the shield and it's not an issue. I have a BluTooth communication intercom installed in the helmet and plenty of room for the speakers. Easy to hear other parties with visor up or down so no issues there. The built in tinted shield is nice, but I don't use it, just not that sun light sensitive. I would recommend this helmet! For the time period that I purchased this helmet last summer 2017, it was the best one on the market, bar none, and it was moderately priced. Very few have the retractable fighter pilot style dark shades! I Love this helmet. My son wore mine once and bought himselfe one that same day!! Nice helmet for the price. The only complaint I have about this helmet is that the tinted visor doesn't work well (it actually didn't work at all when I got it). I had to snap the tinted visor back in place when I received the helmet. I can comfortably wear sunglasses with the helmet so I don't actually use it that much any. The fit was nice and everything else seems to be of decent quality. Very slick looking helmet. And i loved the features on it. I loved the helmet. I have been using it for the last month now. I bought it for looks but it is a very practical unit. The vents help with staying cool and i love the intigrated sunvisor. My only complaint is the bottol edge of the clear visor. It is unpractical and is a complete blind spot. It defeats the purposr of what they were going for i think. Arrived in perfect condition and fit absolutely perfectly. A great value for those looking for a helmet that meets all the basic requirements. I'd recommend using with earplugs if you plan on going over 65mph for longer periods of time, while not a $400 lid (foolish to compare it to one) it's nicely appointed with surprising attention to detail that you'd expect from a higher priced lid. Works great with my KLR as both a commuter to work here in the Bay Area as well as the dirt roads I ride on the weekends. Looks good, over all it's light, added sun shade is awesome. I absolutely love this helmet. It’s not the best in any category but does well with everything and the price is awesome! Love this helmet, very comfy, good looks, lightweight, tons of features! This helmet is has a lot of features, and is a great value. Very comfortable, well ventilated, and the flip down sun visor is fantastic. It fit a little tight right out of the box, but after the first day, and about 200 miles, it was perfect. This is my favorite helmet I have ever owned. The shade visor is a little short, but it works. The fit is perfect and I have a huge, round head haha. I also have a sena installed on it and all the liners easy remove to be able to wash or hide the wires. Great ventilation, wide visibility, dark lenses included, light. Has it all. Good helmet for the price. Lots of features. The sizing is true. Meaning, take the measurement of ur head and buy the correct size. It's comfortable. I've ridden for 2 hours straight and not once have I wished I could take off my helmet or readjust it. When I bought it, one of the deciding factors was that it was marketed as having sufficient space for a headset to be used. I bought a Sena SMH10 and had to cut about 1/4" round circle out of the ear area where I mounted the speakers because as I put on my helmet, the tops of my ears bend over and with the speakers installed I couldn't un-bend my ears. Otherwise, my only legitimate complaint is that this helmet lets in a lot of noise compared to others that I've owned. Would I buy this helmet again for a cruiser? No. But I also have a dirt bike that I will definitely use this for. If u have a cruiser I would recommend a regular helmet. Nice fit. Well built. Both lenses work great. Quick release chin strap is extremely helpful. Good fit, finish, features, and price. 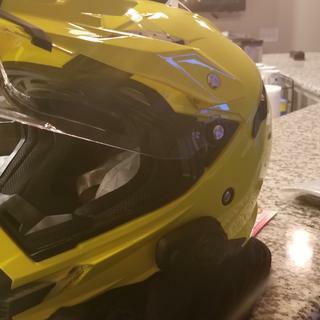 I bought two helmets one for my wife who ride ATVs. The helmets are ventilated well and the field of view is excellent. The shield is not very good in extreme dust conditions. I'd prefer goggles in those conditions. A great helmet with a lot of options. 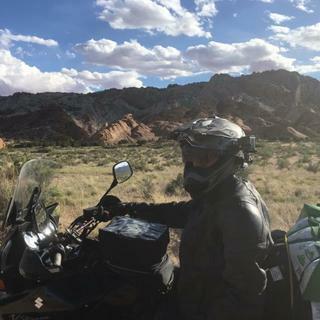 The 2 visor idea is great so you don't need to worry about carrying 2 pairs of goggles with you or carrying along a pair of sunglasses, its all in the helmet. I would recommend it for a dual sport rider for sure! Fit is spot on, clear visor could go up a little farther and there is quite a bit of wind noise. Retractable sun shade is great and I like the chin strap. Overall its a great helmet for the money. Noisy -Rattled. Air/ wind noise. Apparent poor build quality. I ride with the visor in its lowest position and this will keep you from raising the shield to its highest click. Still not enough of a problem to impede vision at all but just an FYI. The cheek pads still squeeze me pretty good in the front, but that's just me. The vents are pretty good (still work fine) but the one at the mouth is kinda cheap and mine is loosening up. I've had a chatterbox X1 slim on this helmet and there was plenty of room for the mic and speakers in this helmet, the actual mount for the unit was a little tricky as the base of the helmet is too wide to allow the stock chatterbox mount fit on it properly. All in all I really enjoy this helmet and will probably buy the next one AFX comes out with after this if that day ever comes. We were looking for a helmet to replace the one my son had outgrown. Since correct sizing is so hard brand to brand, especially when ordering from the Web, we were worried about getting the correct fit. We really liked this helmet due to the style and sun visor. We ordered the helmet, it arrived quickly and in great shape. The fit was perfect and my son loves everything about the helmet, especially the sun visor. Thank you for a great experience and a helmet my son loves and will wear constantly to protect him while riding. Great looking helmet - all my friends want one now! Love this helmet. It is super comfortable and I love the visor feature for when the Vegas sun is in my eyes! The helmet has tons of padding and the strap is very convenient. It's easy to take off and put on without killing my neck. I wear glasses this helmet made my riding much more pleasurable, glasses not fogging up. It fits great. I'm thrilled with this helmet. The field of view with this helmet was probably the most surprising thing. I have had very few issues with it and it is my everyday helmet. Part of my ride to work has me on a highway at high speeds, the visor does not catch the wind. However the helmet itself can catch some annoying side winds. Nothing to really complain about tho. The only thing that I really dislike about the helmet is the noise level. It is louder than I had expected, and the only reason I give this 4 stars instead of 5. Lots of features, vent switches and visor don't seem very durable but time will tell. 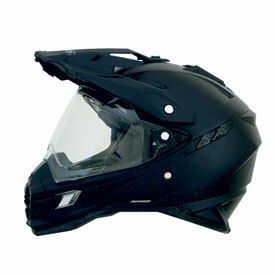 The Helmet is light and the sun visor allows adequate air to pass at high speeds. With plenty of vents I have yet to fog up the visor. The clear and suns visors are perfect for wearing all day long no matter the lighting conditions. For work I get to ride all day long and this helmet is comfortable for that purpose. I love the helmet and I would buy it again. Fits My Oval Shaped Head Great! You cannot beat this helmet for the price. I struggle with most helmets as they are generally designed for a more rounded fit. Helmet noise is not bad either. I wear ear plugs and the sound is really tolerable. Plenty of room for speakers in ear pockets if you're running an comm system. I needed a new d/s helmet and after doing some research I decided on the AFX FX-41. Several of the guys I ride with have them and all like them. The helmet is loaded with great features for the price. Fit is good, and runs as listed, I wear a large helmet and the FX-41 large fit me perfectly. The only complaint is there is quit a bit of wind noise at highway speed, but it's a dual sport helmet not a pure street helmet. All in all nice helmet for the money. Looking forward to warmer weather and many miles with this helmet. For those that have never had this style of helmet before, there is a LOT of wind noise in this style of helmet. This particular helmet's lenses are not optically correct, and I ordered 2 replacement shields with it. No difference after changing the shield, things are still distorted, and worse with the sun shade down. Feels a little cheap, and the visor has cracked already. Fit is OK, but very thin padding in the front of the helmet. I guess I had higher hopes, but likely will never buy this brand again. These are all things I could get used to, but why. If I hadn't thrown the box away, I would have returned it within days of buying it. You can't really go wrong. I always used high end Shoei's and Bell's for sportbikes, but wanted something for my dual sport. I don't really like mx helmets with goggles because I sweat too much and goggles fog up. This AFX is exactly what I was looking for. 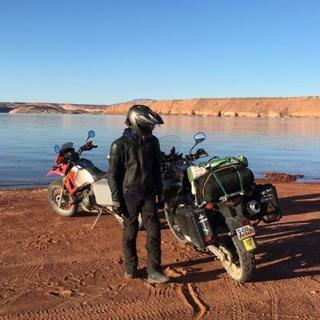 I've ridden it all over Colorado, Moab, and a trip from Colorado to Cali and back. I usually wear mediums and the small fits perfect. The chin strap ratchet make it easy to get on and off. The beak keeps out a decent amount of sun, but does catch the wind when I don't use my fairings. The internal shade is extremely useful and is just as good as sunglasses. It's so good I'm looking at buying a second one in a different color. This helmet is a joke. Out of the box the helmet looked great, until I slid the inner/smoked visor down. It had hot glue on it. There was also hot glue next to one of the plastic vents on top of the helmet. The glue probably leaked from that. I tried to clean the glue off the visor with no success. While I was cleaning it, the plastic piece that was most likely glued on, just snapped off. The washer used for the screw that held the plastic vent in place was actually too small and came right through the hole in the helmet that it was supposed to keep the vent mounted too. The main/clear visor doesn't have a seal at all. The type of seal that you'd expect from a street bike helmet. It's just not there. I'd say there's at least a 1/4" gap. HIS CON was that when traveling at HIGH speeds (80+), if you turn your head the helmet isnt really aerodynamically correct and it kinda whips his neck. Also the helmet is actually a bit larger then a regular MX or motorcycle helmet. I can't really tell from the pictures, but will the face shield accept a pinlock? BEST ANSWER: The AFX FX-41 has a shield but they refer to it as a AFX FX-41 DS Dual Pane Face Shield. It does the same thing by trapping air between two panes. No it cannot be locked bike. Love the helmet, but the visor is very weak. I had to reinforce it by epoxying aluminum to it. Is this helmet designed to support the installation of a bluetooth communicator such as the Sena 20S-01D? BEST ANSWER: I have a VHF/UHF helmet kit installed from Rugged Radio in the helmet. The Left/Right ear speakers in the kit are large and do add some pressure to the my ears when wearing the helmet with ear protection, it is noticeable but not uncomfortable. The helmet it loud with wind noise and I wear hearing protection and recommend it. But the earl plug further decreases room/space in the helmets small ear compartment while being filled with a large speaker or speakers. If the Sena 20s-01d has small ear speakers it will be a no issue at all. I have the Sena10S on mine...Its not a great fit but after many rough rides in two years it has fallen off once. voice activated option does not work well because air flows through the helmet well enough to activate it when you don't want it too. Air noise also sometimes makes it difficult to hear the lower pitches in music play. but I can hear someone on the fone just fine and callers hear me just fine..Despite the flaws Im happy with the combination. I took the lining out and installed a Sena communicator and snapped the liner back in with no issues. This helmet is louder than more expensive models but I am satisfied for the price. It's not specifically set up for that, and I am sure this won't help, but I think there is enough room to install one, depending on your creativity. But if you want plug and play, no. I do love this helmet, but I don't know if it supports a Bluetooth device. I do know the cheek pieces are able to change out to buy new ones for a tighter fit or looser fit. I don't have a Sena system in my helmet but I do think there is enough room for everything to fit. I have not added blue tooth to the helmet yet, but there is plenty of room in the ear area. I run a Sena on mine with no problems. Will this helmet function with eye glasses? I've tried the Bell X9 and I can't get the arms of my glasses past the interior padding. I don't want the hassle of returning the helmet for the same reason. BEST ANSWER: Brad T. My son says that his reading glasses feel fine. When he put Oakley sunglasses on it was uncomfortable. He also said and showed me that his helmet has built in sunglasses. I hope this helped you. I have this helmet and wear glasses. While it works, they don't fit very well. I would get a helmet with dedicated eyeglass channels. Not comfortably. You have to stab it into the padding and even then it may not go between your ear and head. yes my glasses slid right in no problem. Will goggles work with the visor down? BEST ANSWER: I'm not sure I've never tried it with my goggles on. It seems like there would be enough clearance though. Took an early season ride up into some snow country with my quad and I was so glad I'd bought this helmet! Would have turned around after the first mile without it. Do the make a low light replacement visor for the sun shield? BEST ANSWER: Don’t know about that. The sun shield flips up out of the way if not needed. I found on very sunny days that I could combine my sunglasses with the sun shield down, so the shield is on the lighter side. I like the option. For commuting to work and back I don’t need to bring my sunglasses.